Join Finn & Friends (from Goldfish crackers) for some fun sleuthing in this entertaining, child friendly, interactive book app. And it's free! While Finn & Friends is a promotional app for Goldfish crackers by Pepperidge Farm, it is actually a very good and child friendly app – and it’s free! 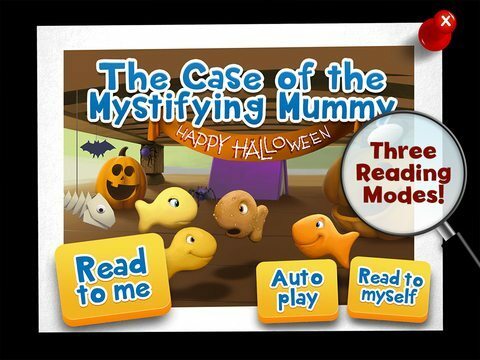 The Halloween story “The Case of the Mystifying Mummy” follows Finn and the other Goldfish friends as they sleuth their way through the story to find a mysterious figure that wakes Gilbert with a fright. Readers of different levels get to follow along and help the Goldfish detectives by playing mini-games. The two other stories in the app, The Case of the Rainbow Tale, and The Case of the Missing Hamster are equally good fun. This is a high quality app in every regard. Good visuals and narration bring the story to life, while fun extras such as photo booth and mini games add to the interactive experience. We feel that most books are educational on some level, as an interesting story promotes a love of reading. This book app appeals to both pre-readers and readers. With word highlighting in Read To Me and Auto Play modes, this app supports word recognition and vocabulary building for emerging readers. The stories themselves are entertaining, but the interactive elements such as the mini games and themed photo booth make this an incredibly fun little app. Children will definitely enjoy photo booth, where they can take a photo and decorate with different themed stickers and frames (Halloween, Christmas, etc) before saving to the camera roll. What’s not to love about an app that is beautifully designed, entertaining and free? While this app is one big advertisement for Goldfish crackers, it is never feels like it. There is even an “Ad Nooze” graphic in the corner of the home screen telling you that it is an ad. There are no external links, in-app purchases or social media. Apart from the characters themselves, there’s no Pepperidge Farm or Goldfish crackers logo or other branding. The app is getting a lower score because it is a promotional app for the Pepperidge Farm brand.